For many people, flossing is a hassle. Flossing can take extra time and can be painful at the beginning. However, there is a reason dentists are constantly reminding you to floss. A study published by CDC’s National Center for Health Statistics stated that in 2011-2012, approximately 91 percent of U.S. adults had dental cavities. Why the high percentage? One reason could be that adults aren’t flossing. About 4 out of 10 Americans floss once a day. Most dentists argue that it’s not necessarily when you floss but how you floss. 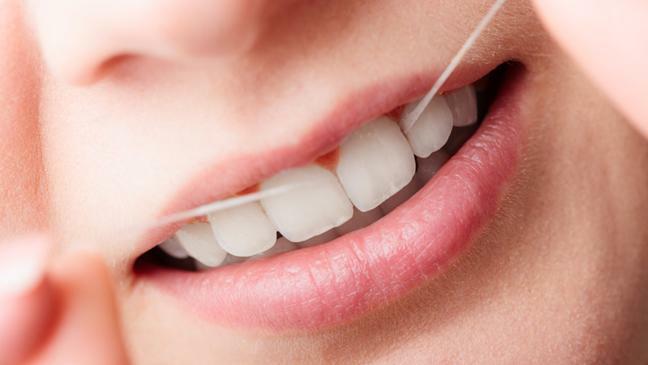 Consider when the best time is for you, then follow through to make flossing a daily habit. Some dental experts have claimed that flossing before you brush your teeth is a good practice because you are less likely to skip it. Not to mention, flossing before brushing can loosen up plaque and debris that your toothbrush can then later pick up. If you are someone who is always rushed for time, consider trying to floss before you brush so you don’t forget. On the other hand, other experts argue that flossing after you brush is a good practice because the floss will help the fluoride from the toothpaste get in between your teeth. Flossing before you brush can give you a sense of overconfidence that could cause you to not brush as well. Therefore flossing after you brush your teeth may be better for you as well. Don’t use floss to “saw” between your teeth. Many adults mistakenly use their floss like a “saw” between their teeth. Be aware that if you use this method, you’ll be missing spots. Instead, use floss to rub up and down the sides of each tooth. Sliding floss against the actual tooth surface will thoroughly do the job. But how do you reach your back teeth? Getting to the back teeth can be a bit tricky. One tip you can use is to use a floss holder to reach the back of your mouth. If you don’t know what a floss holder is, it’s a plastic handle that has floss at the end. You can find floss holders at any local grocery store. Also, people commonly use a floss length that is too short. If your floss is too short, it’ll be much harder to control and use. Dentists recommend that your string of floss be 18 inches long. Sorry, but it’s true. Mouthwash is great for your mouth, but it won’t be able to get all of the plaque that builds up in between your teeth. But don’t toss your mouthwash out! Mouthwash is a great way to rinse the remaining bacteria and plaque out after you floss. How can you make flossing more fun? Don’t think you have to stand in front of the mirror the whole time. Flossing is a great activity for multitasking. Turn on your favorite television show, read a book or magazine, watch YouTube, or find another activity you’ll enjoy while flossing. You’ll be so engrossed in your entertainment, you won’t notice the time go by. Make yourself more comfortable by using the right thickness of floss. Dental floss comes in different shapes, lengths, and widths. Dentists don’t have a preference when it comes to using wax or thread floss. Flossing can be easier if you choose a thickness of floss that compliments the size and distance of your teeth. For example, if you happen to have wide gaps between your teeth, use a floss with a thicker width. If your teeth are very close to each other, using a wax floss will make it easier for you to get in between them. After a long day, it’s easy to forget to floss. You don’t have to tie a piece of floss around your finger as a reminder (unless you wanted to). Simply put your floss out by your toothbrush. That way, when you go to brush your teeth your floss will be right there. You won’t have to dig around your drawer for it, and you’ll be constantly reminded. Hopefully you found these tips helpful! This post was sponsored by Modern Dental Care, a dental practice located in Las Vegas, Nevada.